#1: Wow… that is a REALLY REALLY unimpressive box. I’d be more impressed by multicoloured toilet paper. That’s how unimpressive it is. #2: Why is this Sense UI so confusing? Or is the Android UI itself confusing… and the Sense UI just adding a little more confusion on top of it? I may no longer be the gadget freak I used to be, but I’m pretty sure I have enough brain cells to figure out a well designed UI. #3: One major disadvantage to buying HTC is that you need to wait for the dudes over at HTC to add their own ingredients to any Android updates that are released… meaning you are instantly at the back of the bus in terms of Android updates. 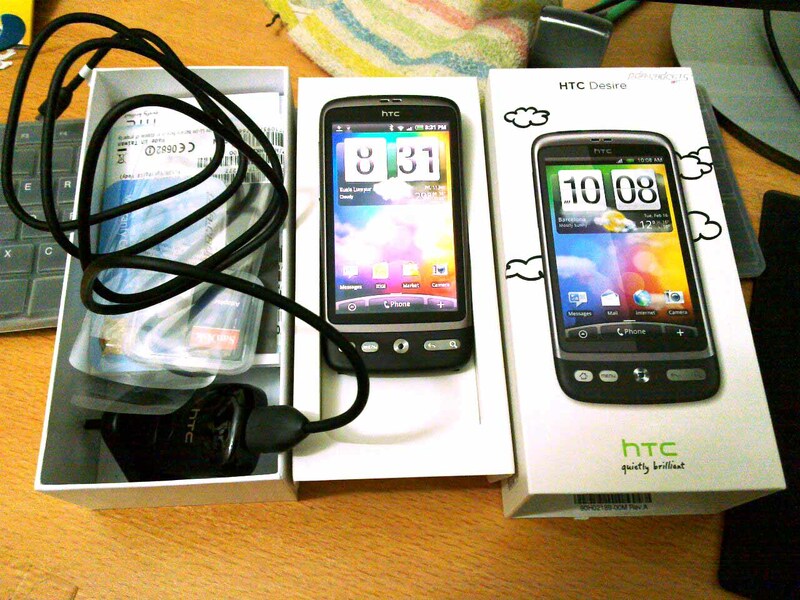 #4: This should have come earlier the chronological order but I managed to forget about this; the HTC Desire I received came with a flat battery. NEVER give a geek a new toy with no juice… it’s like flaunting perfect boobies in front of a blind guy. #7: I have nails (and am unable to cut them too short)… this in combination with the capacitive touch on the HTC Desire makes me want to stab, punch, and step on babies. EVERYTHING becomes more difficult. #8: Credit where it is due… the screen on the HTC Desire is amazing. It should be pretty obvious even from the picture above. I love the screen… and wish I could transplant it onto my N900. #9: WiFi reception… disappointing. On the verge of disconnecting from my AP, when I’m sitting at (a maximum of) 10M away from it. Sure, there’s a wall or 2 in the way… but I have no such problem with any of my other wireless devices (including the N900). #10: Attempted to use the HTC Desire to tweet (http://www.twitter.com) while watching the first match of the 2010 World Cup (RSA vs MEX). Gave up about 10 minutes in thanks to the capacitive screen, nails, et. al. Instead, stood up, took a walk, grabbed my Macbook Air and proceeded to be content until halftime when I duly fell asleep. #11: I really like music. I like to take a crap in the morning. I like to listen to music while I take a crap in the morning. I was unable to get the HTC Desire to play my music library over the air via DLNA/UPNP despite doing some research. Currently sitting at 25% probability that I would buy the HTC Desire (20% of which is the screen). This entry was posted in Uncategorized and tagged htc desire, maxis. Bookmark the permalink.